Kelvin Connection Bias Tee is designed for applications where both DC and RF signals are applied to the Device under Test (DUT) and precision DC measurements are required. A high resistance of the DC coil results in a voltage drop that leads to a DC Biasing voltage error in the measurements. 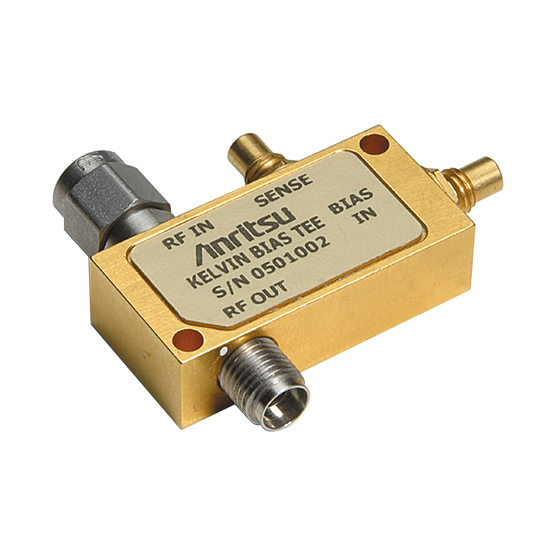 A Kelvin connection bias tee is used to eliminate DC Biasing errors as the sense coil allows accurate measurement of the DC Voltage applied across the DUT. Both 40 GHz and 65 GHz models are available with precision K Connectors and V Connectors respectively. A male connector for the RF input and a female connector for the output is the standard interface for K252 and V252 Bias Tees. A SMC connector is standard for DC Bias and Sense connections. Other connector types with different connector configurations can be ordered through factory.